5:05 pm — Reporter Taylor Bisciotti updates live from Athens Regional Hospital where three crash victims are in fair condition. One person remains in critical condition. Matthew Shaner was discharged from Athens Regional Hospital earlier today. Stephen Shoemaker is now in stable condition at Northeast Georgia Medical Center. 11:35 am — Reporter Taylor Bisciotti spoke to Athens band Wiley Eyes’ guitarist Patrick Eaton who says he doesn’t think this incident will change how bands travel. Athens, GA — Monday at 7 a.m., a 15 passenger van was traveling southbound on I-85 towards Atlanta from South Carolina. 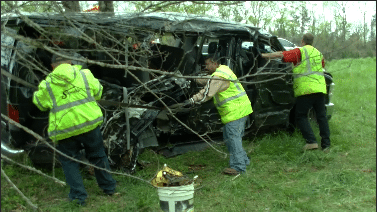 The vehicle left the roadway around mile marker 147, traveled down an embankment, and struck a tree. There were 12 occupants total. The driver was not injured. There were three fatalities and eight injuries. Passengers were sent to Athens Regional Hospital and Northeast Georgia Medical Center. The GSP Specialized Collision Reconstruction Team (SCRT) is conducting a follow-up investigation. Charges are pending. Below are the names of the 12 occupants. There are still only three fatalities.